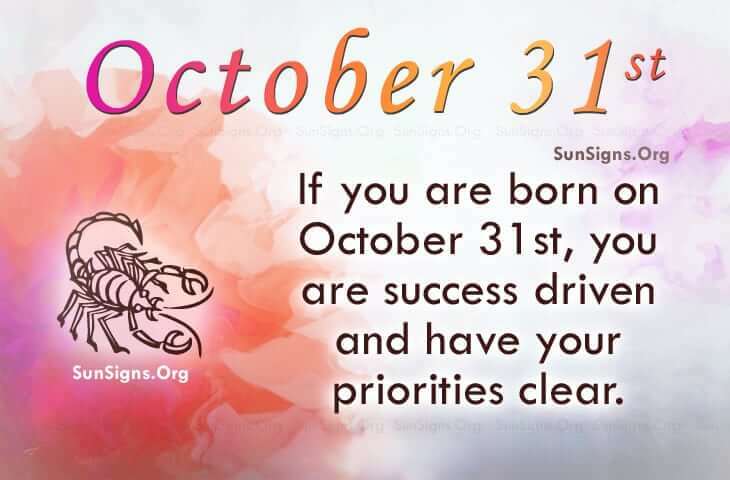 Famous people born on OCTOBER 31 are Scorpio who are success driven. It is on their priorities list of things to do. They certainly have the enthusiasm and know-how to be anything they so desire. They seem to embrace challenges or momentary stumbling blocks. Everyone holds them in high regard. They don’t let things people do bother them. They simply don’t have the time to waste or the energy. But at the same time, they don’t hold back anything either. Typically, famous October 31 celebrities are not someone who need validation from others as they are extremely confident in their capabilities. They are a person who likes things done in a certain way… usually it’s the way they think is best. They could be a bit different from the other Scorpios. Famous people born on October 31 speak what’s on their mind. Scorpios born on this day are usually very cool people. They have concern for their fellow man and are passionate about equality and justice for all. This could be helpful while they are contemplating their career. It could be that they aspire to market their creative ideas or those of someone else. Or they love to sing and have a very unique voice. There nothing stopping them from becoming famous either. People look up to famous people born on OCTOBER 31st. Scorpios born today love being tested. They welcome conflict as a learning experience. Some say that they have their unique way of getting things off their chest. However, they can be difficult.